Li Liu was born in the city of Shenyang in the Northeast of China. At the age of six she began her acrobatic training, and the following year she was chosen to attend the Chinese National Circus School in the capitol city of Beijing. While in Beijing she trained for eight hours a day until she was 16. In 1984 her artistic cycling act won a gold medal at the prestigious Festival Mondial du Cirque de Demain in Paris, France. She often teamed with her sister Liu Ying to create duo acts that were conceived by her coach and father Liu Gui Ting. 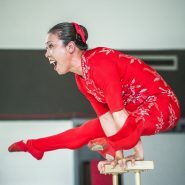 In 1995 their duo hand balancing act was selected to perform at the Wu Qiao International Circus Festival, where they were awarded the Golden Lion prize. 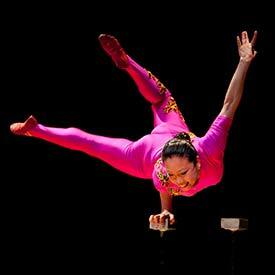 For many years Ms. Liu traveled extensively throughout Europe, Africa, and Asia with the Liaoning Acrobatic Arts Troupe. She has performed with Zirkus Knie in Switzerland, Circus Krone in Germany, and with countless other touring shows in Italy, Holland, France, South Africa, Singapore, Japan, and Indonesia. She came to the United States in 2000 with Ringling Brothers Barnum & Bailey Circus and toured all over the U.S. for two years. She has been living in the U.S. and working as a freelance performer since 2003. She is a regular on the NBA & WNBA half-time circuits and is also is a featured performer on Princess Cruise Lines. In September 2010 Li appeared on The Late Show with David Letterman. The kids and teachers loved it—She is so talented and engaging! Excellent performer and performance! Li's talent is very impressive and the students loved the show. I found her stories and incorporating Chinese words into her act to be a valuable experience for the students.